When agent Wellington Brooks, Esquire, meet agent Eliza D. Braun, it makes noise. Exploding noise. Screaming to death noise. Now "Welly" will not ever been quietly working in his archive in the basement of the Ministry. In fact, "Miss Braun" will lead him to pursue a secret society which tend to rule the world. Will they manage to avoid "Queen Vic" some disagrement, even over some partner's body ? It is the first inquiry for our duo in the name of the Ministry of Peculiar Occurences. An other british spies story ? Not exactly. 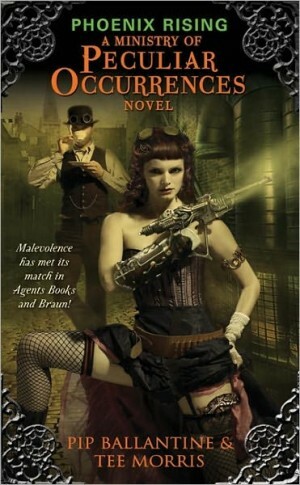 The authors manage to mix the exotic seduction of the colony with the parangon of the gentlemen manners in a steampunk Victoria's period. It results in a perfectly british novel with all the classics we can hope to: revenge, spies, secret society and of course gadgets. Using a couple of main caracters so opposite (male and female, field and archivist agent) is very common but still work perfectly. The style is sharp and suspens come easily during action's scene. A good time for some foreplay before the main course is coming. Saddly it is a lot of that: waiting. This first book just plot the scene for a serie, because lots of unexploited ways tend to bait us for following expectation. For the story itself, it is very basic and with no astonish surprises. Some leads are so obvious we just guess what will be the next move. FInally you just continue to read in order to see the evolution between our two partners and this is really the masterpiece of this book. A great gasp of fresh air but still waiting for the next one.